This delicious range of farmhouse sheep milk cheeses from Gippsland, Victoria first caught my eye (or should that be taste buds?) while I was judging for the Sydney Royal Cheese & Dairy Produce Show. I was delighted to discover that they were made by Burke Brandon, the son of some of my other favourite cheese-makers, Jan and Trevor Brandon of Red Hill Cheese in the Mornington Peninsula. A natural born farmer, Burke had been helping Jan and Trevor make cheese at Red Hill Cheese for years and had also bought a flock of dairy sheep with the aim of making his own range of farmhouse cheese under the label Prom Country Cheese. It’s fantastic to see these sorts of multi-generational cheese-making families in Australia (Burke’s grandmother also made cheese), and this operation is still very much a family affair for Burke, his wife Bronwyn, their children, and parents Jan and Trevor. 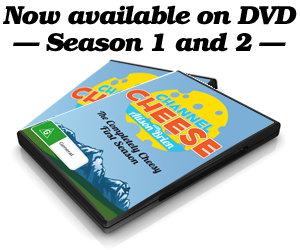 For this video, we tasted the range of Prom Country cheeses at the Red Hill Cheese cellar door, but Prom Country Cheese will soon have their own cellar door open for business – check in on their website here for details and updates. A huge thanks to the entire Brandon family for the amazing hospitality showered on us during this visit! Copyright 2014. Motion Picture theme was created in WordPress by Obox Themes.